Posted on March 18, 2016 by Philip O'Hanlon. Well, better late than never. Had a whole backlog of show reports we did not publish due to my traveling schedule, so please bear with us during the next week while we catch up on our publications. 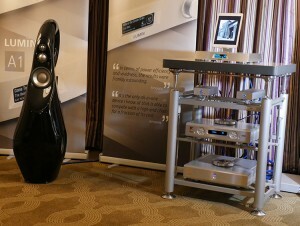 While attendance was light on Wednesday, the first day of CES, the room was beautiful, the equipment was well presented and the sound quality was glorious. 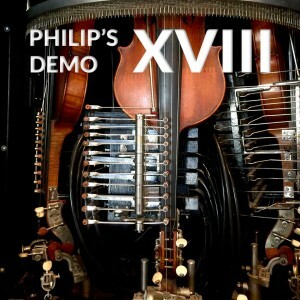 We had a great time meeting up with old friends and sharing our most ambitious compilation to date—Philip’s Demo XVIII. I must confess I never paid any attention to dampening plates positioned on top of equipment before. 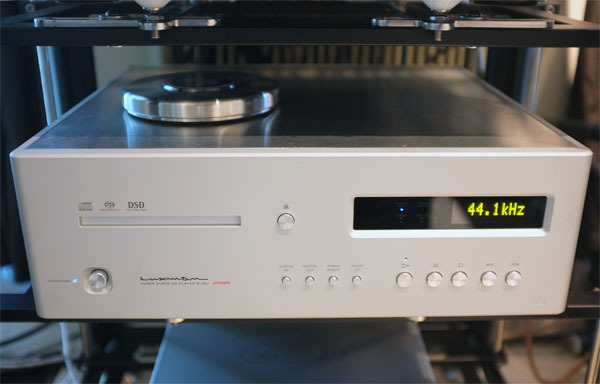 But when Tatsu Sueyoshi from Luxman started to rearrange the position of the Artesania dampening plates on top of his Luxman equipment, we were amazed at how he was able to tune the system by simply drawing away mechanical resonances. The system became much more natural and the sound more focused. The end of the first day delivered a real treat. Stereophile’s Jason Serinus and I were discussing the equipment list for his Show Report and Lori Lieberman was behind us and started rehearsing for Thursday’s unplugged performance. 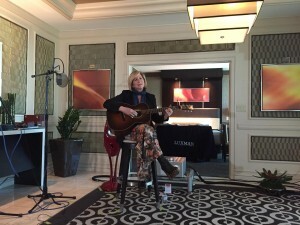 Unconsciously, we stopped talking and just listened to Lori’s wonderful singing and guitar accompaniment. Her voice was soft, natural, and delivered such emotion—we were mesmerized. Read more about Lori Lieberman’s performance here. Lori Lieberman wasn’t the only celebrity guest that popped in to put our system to the test. 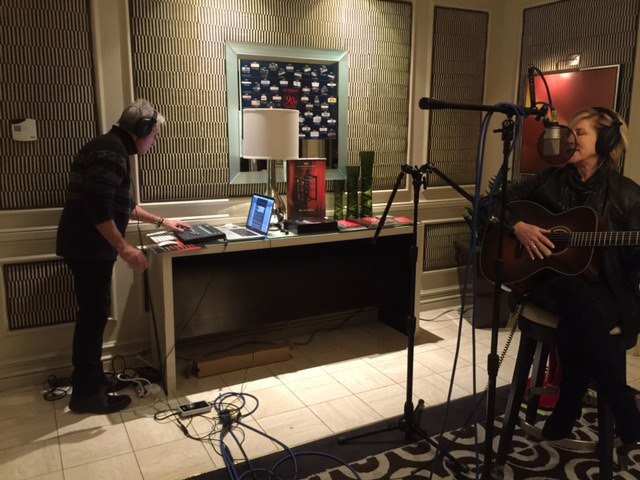 We were also honored to have Graham Nash stop in to have us play a few tracks off his upcoming album. And the verdict is in. See what Graham Nash thought of our system. Having listened to the B1 Decade at Music Lovers two Reference Rooms, Berkeley’s is approx. 500+ sq. ft. while the SF store’s room is approx. 300+ sq. ft. It sounded much more intimate in the smaller room. Knowing the generous room dimensions of the Mirage’s penthouse suite, we took a precaution and called Arian Jansen from SonoruS to ask if we could borrow his proximity subwoofer controller for CES. Arian did a marvelous job of dialing in the Eclipse TD-520SW subwoofer into the system. The proximity sub does not extend the LF—rather it augments the bass, so that what you hear at the listening chair is similar to what you would hear if you were sitting just 5’ from the speakers. 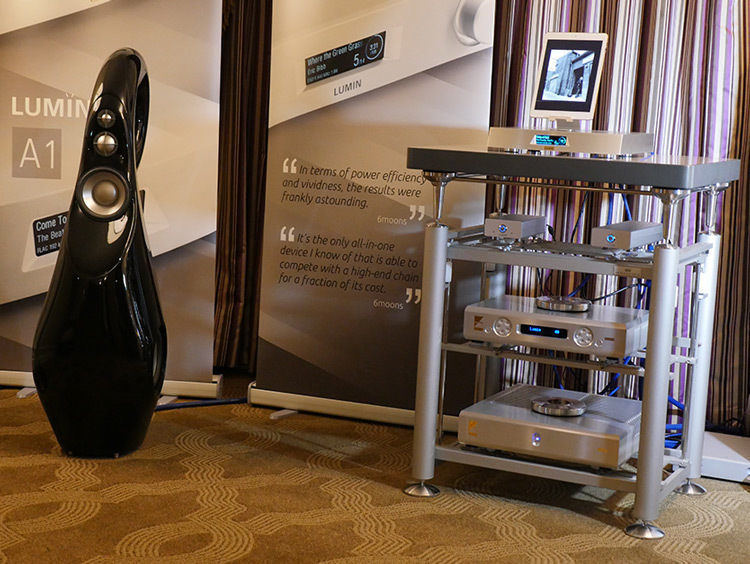 On the last day of CES, David Chesky came in for a listen to his own recordings on the system. He asked if we could move the couch closer and turn off the sub. We moved the listening chair 4’ forward and 8’ from the speakers. The results were spectacular. But of course, now only one or two people could really enjoy what the speakers were capable of. Near-field listening can be very exciting; the immediacy is intoxicating. It sounds as if the performer is singing right in front of you. Check out the Eclipse TD speakers for a terrific inexpressive near-field experience. We first showed the Artesania racks at RMAF 2015, but this year at CES, with the help of Cayetano Castellano from Artesania we spent the first day installing racks far and wide across Vegas. These are the quietest racks we have ever used. Really do add a wonderful sense of ease to the sound, as well as lowering the noise floor. Jae Wheeler from Music Lovers mentioned that he never heard the Revel Salon’s deliver such deep & tight bass before. 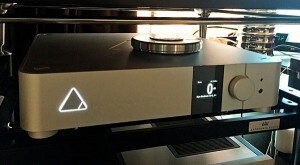 Exhibitors using the Artesania racks included: Constellation, Harmon Group (Mark Levinson & Revel) Lumen, Metronome, Synergist Research, Viola & ourselves. Clips I saw looked stunning, high production values and very tastefully executed. No jerky, hand held amateur hour footage— rather super stable, excellently light and first class all the way, just like their products. We will post that video shortly. A huge round of thanks have to be extended to Joe Cali for organizing the Lori Lieberman concerts as well as recording them. It really was an ear opening experience. Thanks to Jon Iverson for organizing the visit from Graham Nash; it was a pleasure meeting him. Very nice down to earth chap, no silly attitudes nor BS. The new album sounded great—it’s on my must purchase list. 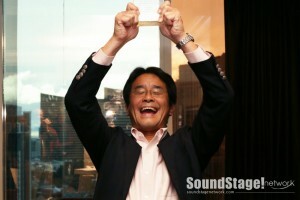 Tatsya Sueyoshi accepts SoundStage’s POTY 2015 Award for L-550Ax. Photo credit: SoundStage! SoundStage! 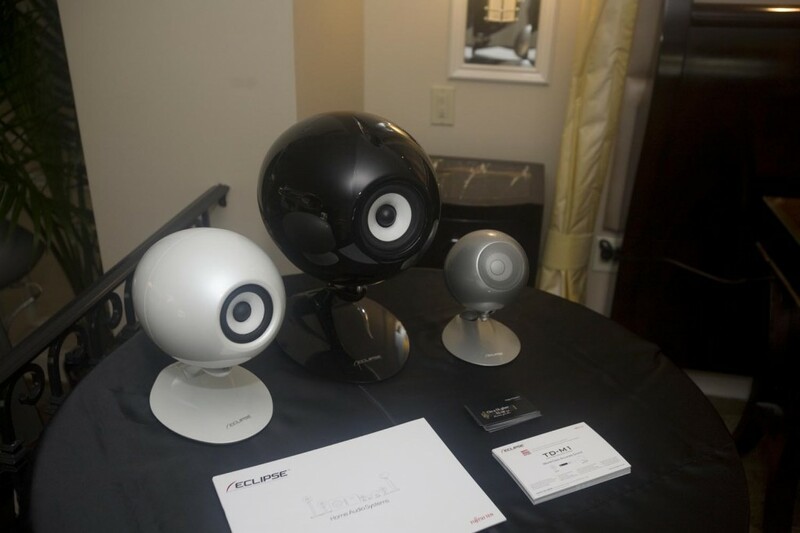 announced the winners of their 2015 Products of the Year Awards. 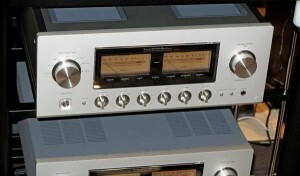 Among them was Luxman’s L-550AX integrated amplifier. The awards were given out at CES, as usual. In the picture to the left, you can see a very excited and proud Tatsya Sueyoshi accepting the award for Outstanding Performance in Integrated Amplifier category. It’s a fine amplifier—we are very pleased to see it getting the recognition it deserves. Read more at SoundStage! Hi-Fi. A closer look at our equipment on Artesania Audio racks at CES 2016. Graham Nash listening in OAHN room. Photo credit: Michael Lavorgna, Audiostream. Luxman D-08u at CES 2016. Photo Credit: Michael Lavorgna, Audiostream. Steven R. Rochlin of enjoythemusic.com interviewed Eclipse’s Hideto Watanabe and myself during their live-stream from CES. You can watch the video here. Rochlin and I also talked about our room in a separate part of Enjoy the Music’s live-stream, which is available to watch here. Thank you to Steven Rochlin and enjoythemusic.com for those videos. 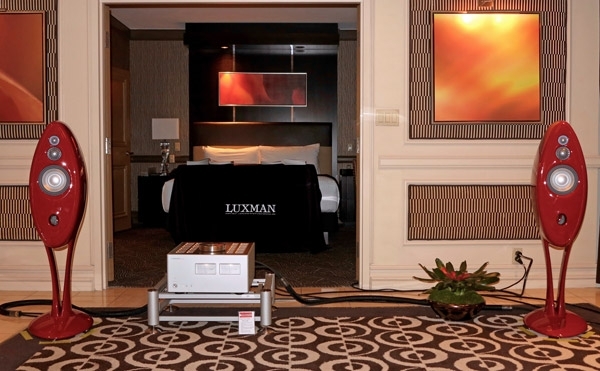 Luxman L-590Ax II at CES 2016. Photo credit: Jason Serinus, Stereophile. 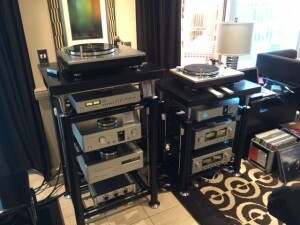 Artesania Audio equipment racks were displayed in many rooms at this year’s CES by the following manufacturers. We are honored to have been chosen by Artesania to be the North American distributor of their exquisite equipment racks. 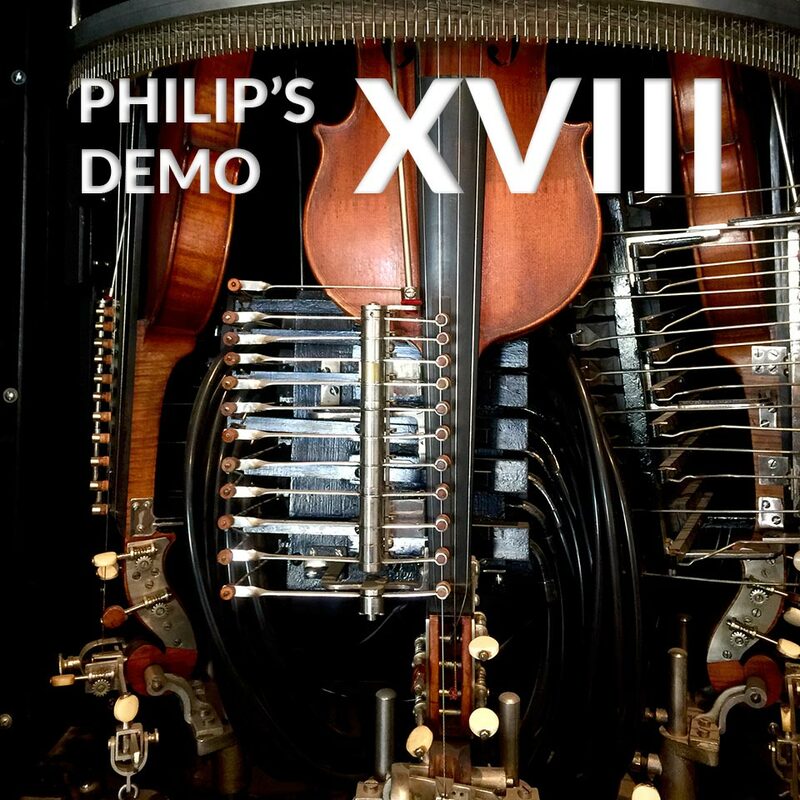 This entry was posted in Show Reports and tagged Artesania, AudioStream, CES, CES2016, David Chesky, Eclipse TD, Enjoy the Music, Graham Nash, Lori Lieberman, Luxman, Luxman L-550AX, Merging Technologies, SoundStage! Network, Stereophile, The Absolute Sound, Vivid Audio.